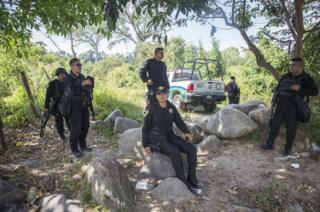 Sgt Conchita Lopez, 28, is one of 10 policewomen in the border town of Tapachula in Mexico's southern Chiapas state. 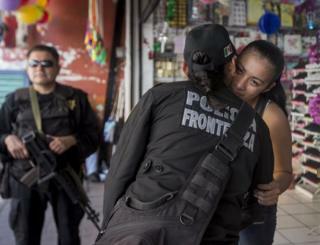 For six years she has been a member of the Mexican State Border Police. Tapachula lies 32km (20 miles) from the border with Guatemala and is an entry point for many migrants fleeing violence and poverty in Central America. Sgt Lopez has five sisters and five brothers, one of whom is in the Marines. "I kept trying to get in, but there was never a space for me so I did private security for a while and then joined the police," she explains her career choice. She is the only female member of her family to join the force. 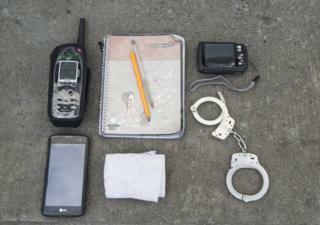 As the sergeant in charge of the patrol she has to prepare all of her kit before setting off. 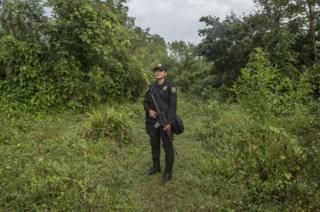 "I'm part of a police unit that looks after the rights of migrants crossing the border," explains Sgt Lopez about her role on border with Guatemala. 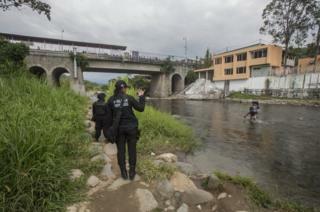 Sgt Lopez spends much of her time on patrol in the streets of Tapachula. "We have many hotels and shelters here which house migrants from places such as El Salvador and Honduras," she says. "We used to have a little place in the square for women who had been trafficked. It's a very common problem in Tapachula. It was a place for them to get legal advice and support, but it closed down. I would really like to do more to help them. At the moment I do a talk in a drop-in centre at the border to warn women about the tactics men use to trick them." 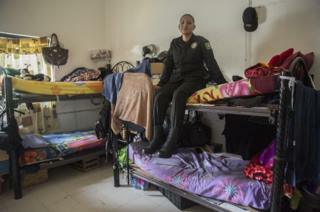 Although her family lives in the same town, Sgt Lopez has to stay and sleep in the police station for four weeks at a time while on duty. All the food in the station is prepared by the police officers. They work, live and eat together for the duration of their four-week long shift. 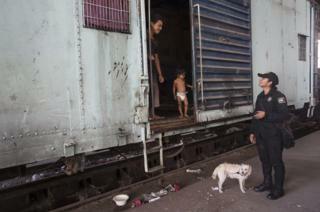 As Sgt Lopez carries on with her patrol, she comes across a young family living in an old railway carriage. 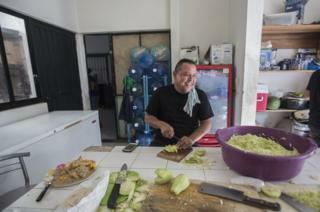 The family is from Yucatan in Mexico and are visiting family in Tapachula. They live in the empty carriage because they cannot afford a hotel. 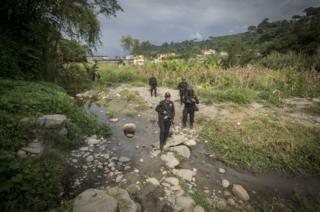 The border between Mexico and Guatemala is a popular crossing point for migrants trying to reach the Unites States. They come from El Salvador, Honduras, Venezuela and some from countries further afield such as Cameroon, Ethiopia and Eritrea. Image caption At the Talisman border crossing point Conchita walks down the river edge to keep an eye out for passing migrants. As Sgt Lopez approaches the river's edge a man carrying a heavy load turns and walks back to the Guatemalan side of the river. "Some people are afraid of the police. We know that there are bad police officers who often extort money from people bringing goods across the river," says Sgt Lopez. 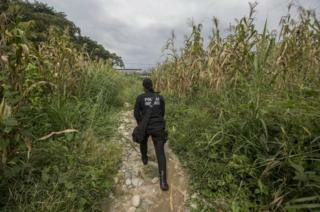 "There used to be a checkpoint nearby so they take this path to avoid it. It's where women have had their goods stolen so we regularly check it." 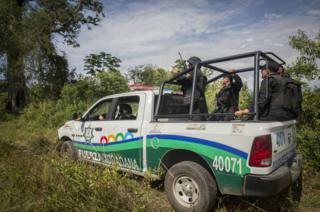 Migrants often follow the rail tracks to try and avoid checkpoints along the route. "It's really hard for migrants as they come to escape from violence and often when they get here they experience the same thing." "On my five days off I just get straight into my own clothes and visit my boyfriend. He's cool with me being a police woman." 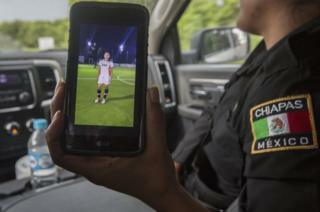 On her Sundays off Sgt Lopez plays football for the Tapachula women's team. "I get to be out there helping people," says Sgt Lopez. "I want to help people. I like to deal with the bad guys." Alison Baskerville's trip was supported and funded by the Adelante Fellowship on behalf of the International Women's Media Fund (IWMF). 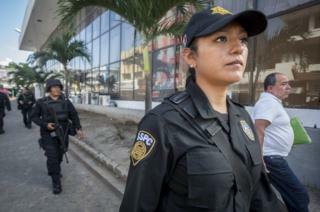 100 Women 2016: Are Mexican women less corrupt than men?